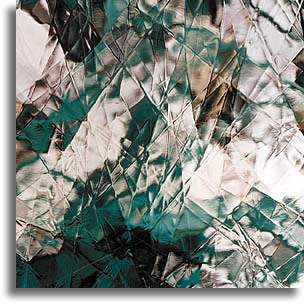 Spectrum calls it scribed antique glass because the texture is literally scribed into the transparent glass surface immediately after sheet forming while the glass is still extremely hot and pliable. Artique was developed to bring you the look of antique glass without the hefty price tag of hand blown sheets. This glass makes great backgrounds as well as suncatchers, and provides excellent light transmission with little distortion. Oceanside has changed their formula for making waterglass. If you see 96 in the part number, it is the new version that is now COE 96 compatible.